So, we had success. It’s only been one night, and I know that often progress is 3 steps forward, 1 step back. However, I am kind of over the moon right now. At the last attempt, we had just taken the side off her crib and that didn’t go over well (she was probably afraid of falling out). So, I just happened to look on Craiglist and I found a Ariel Mermaid toddler bed for sale for $25. BOOM I jumped on that. Cheesiest bed ever but if my kid will love and it and sleep it in it? No problem. And if she doesn’t? I’ll just sell it and get my money back! I figured it would be a low risk investment. So, yesterday we set up the toddler bed and she’s pretty excited about it. The hubs and I take apart her crib (while she’s in the room). I figured it would be important for her to see us taking down her crib so she wouldn’t be surprised or wonder what happened to it. It made me so sad to take it down. I started crying. I thought about how it just felt like yesterday that we were setting it up. I started having all these worries that I was kicking her out of the crib too soon. Lots of kids stay in the crib until they are 3. But recently it had just felt wrong putting her in the crib. I mean, she’s so independent in so many ways that having to pick her up to put her in and pick her up to take her out, just seemed wrong. She’s also really big for her age so I just felt like I had this big toddler who could potty all by herself, sleeping in this bed meant for a baby. It felt wrong. But I also know how attached she was to her crib. It’s not like she had any problems sleeping in it, or ever tried to really climb out of it. It was her little safety secure place. Would she scream and cry an awful “I want my crib back” scream of terror? I was just an emotional wreck over it. The crib was gone. Night was coming. This was happening. We still have an adult full size bed in her room, so I made sure to tell her I would be sleeping in the room and be there with her in case she needed me as she got used to her new bed. Come bed time, she was happy to get into bed. She was also happy to GET OUT of bed. She was figuring out that wow, she could get up, go open the bathroom door, and go potty. She did this about 3-4 times until I told her okay, enough, it’s bed time. I had to threaten to “leave the room” if she wouldn’t lie down in her bed. I did actually have to leave the room for 5 seconds and she cried. When I came back in she agreed to lie down in her bed. And, drum roll…. she fell asleep!!! She woke up in the night to go potty, got out of bed herself, opened the bathroom door herself, and went potty almost all by herself. I had to of course dispose of the pee and help her get her pull up back on. She then walked back to bed and stayed asleep until 6am. She woke up, had to pee, and asked for some milk. Her pull up was dry too! Second night in a row. She drank her milk in bed and then eventually got up and we started our morning. I was shocked. I couldn’t believe that it happened. She slept! I slept! I think in a few more months she might be able to go potty all by herself. We’ll have to see where she is with things and her fear of the big potty. That’s another post. I’ll have to take a picture of the awesome set up I have going on with that but she still won’t use it. Anyway, here’s a picture of her this morning! That door next to her bed is her bathroom door. 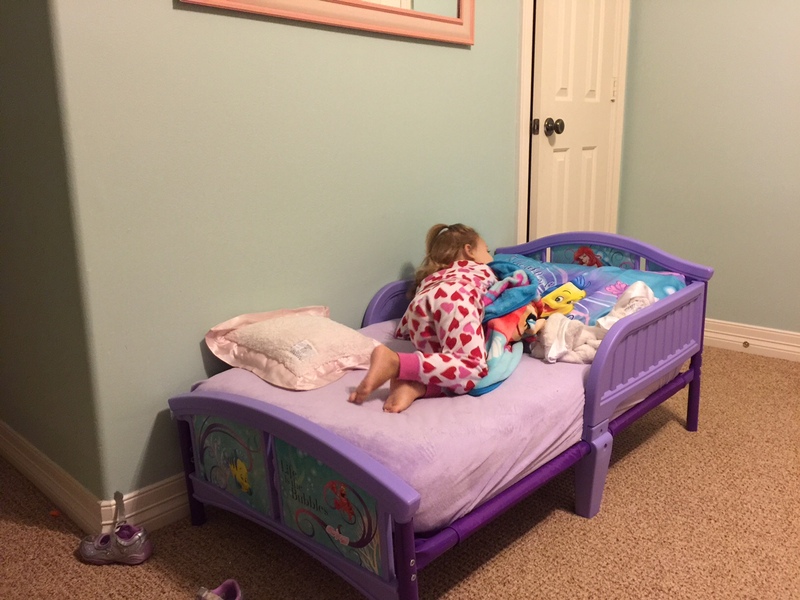 We put her toddler bed in the same spot and same direction as her crib. Yay cheesey mermaid bed for the win!!! That is so awesome that she did well with the transition. Totally makes sense to have her there while you switched things around. Do you have any little friends that go potty on big toilets? That helped Wallace a lot with his fear of it. That’s a good idea about the friends. I will have to ask around or at least try to get her cousins over that she admires!! !